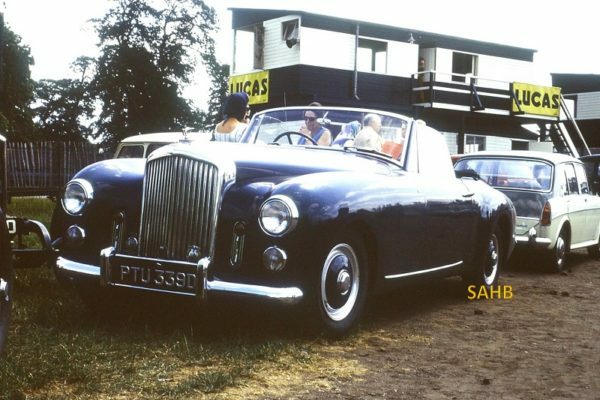 This snapshot of a Bentley, taken at Oulton Park at a Richard Seaman Trophies Meeting in 1971, was initially rather difficult to identify. Firstly, the registration is clearly not contemporary with the car. In the 1970s there was less concern to make sure that a new number, for example for an imported car, was from the appropriate date series. The number is from 1966, but how old was the car? The first clue is the shape of the body, which was almost certainly by Graber of Switzerland. The Internet then showed a remarkable number of post-war Bentleys bodied by this coachbuilder – with a similar body shape but with a wide range of variations in the air inlets (or horn grilles) between the side-lights and the radiator: horizontal, circular and vertical – with just a few having this unusual pattern of a vertical grille containing the direction indicators. The key difference in all these versions lay between the Mark VI and the R-Type: the latter always seems to have a single-piece curved windscreen. So we are going to suggest that this is an R-Type from 1952 to 1955. Graber (also known as Carrosserie Hermann Graber) was a coachbuilder based in Wichtrach in central Switzerland. Between 1927 and 1970 the firm supplied coach-built bodies for various European and US car manufacturers. Graber had a particularly close relationship with Alvis, providing this manufacturer with bespoke bodies for almost twenty years, mostly during the 1950s and 1960s. The Graber company’s first car, a two-seater cabriolet on a Fiat 509, was presented in 1927. Two years later a Graber-bodied Panhard & Levassor 20 CV won the Concours d’Elegance at St. Moritz. During the 1930s the company built a number of special bodies on a range of chassis from Alfa Romeo, Bentley, Bugatti, Duesenberg and Packard. After the second world war Graber concentrated on special bodies for the leading luxury manufacturers in the UK, in particular Alvis and Bentley. In 1946 Graber made its first Alvis body and by 1953 acquired the Swiss distribution rights for Alvis Cars. However, this did not preclude Graber from making a wide range of bodies for Bentley, on Mark VI, R-Type and S-Type chassis, and for Rolls-Royce. Hermann Graber died in 1970 and the production of special-bodied cars at Wichtrach came to an end. About 800 Graber bodied vehicles had by then been produced.